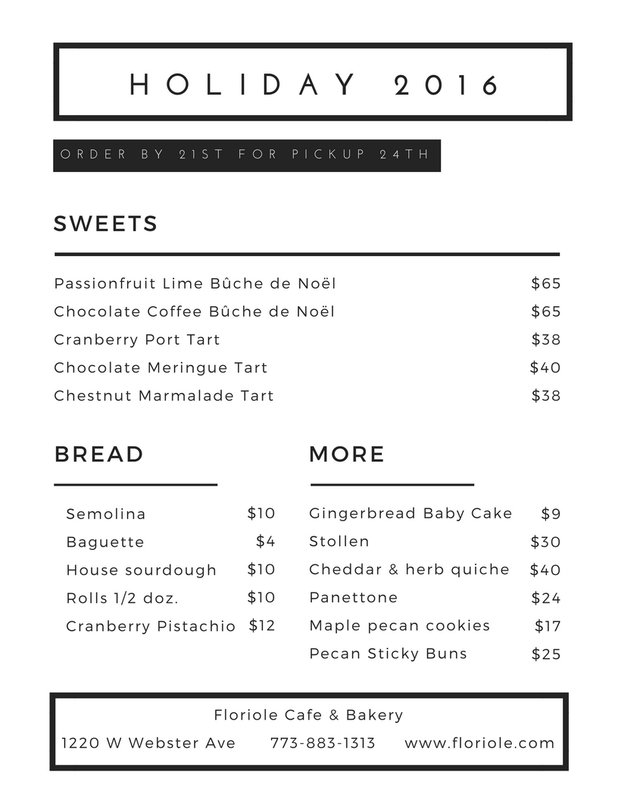 The holiday menu is up and we are taking orders. Please place your order by December 21st for pick-up December 24th. Orders for other dates will require at least 48 hours notice. After visiting Paris earlier this year, Mathieu lamented that crêpes in chicago just aren’t the same as they are in France. The next month we were planning a crêpe dinner menu! We are a collection site for Chicago Cares: Warm Up Chicago. Please consider bringing in new or gently used hats and gloves or for Chicagoans in need. It’s getting cold out there! Here we are. It’s November! That means that Thanksgiving is around the corner and the holidays will be here before we know it. 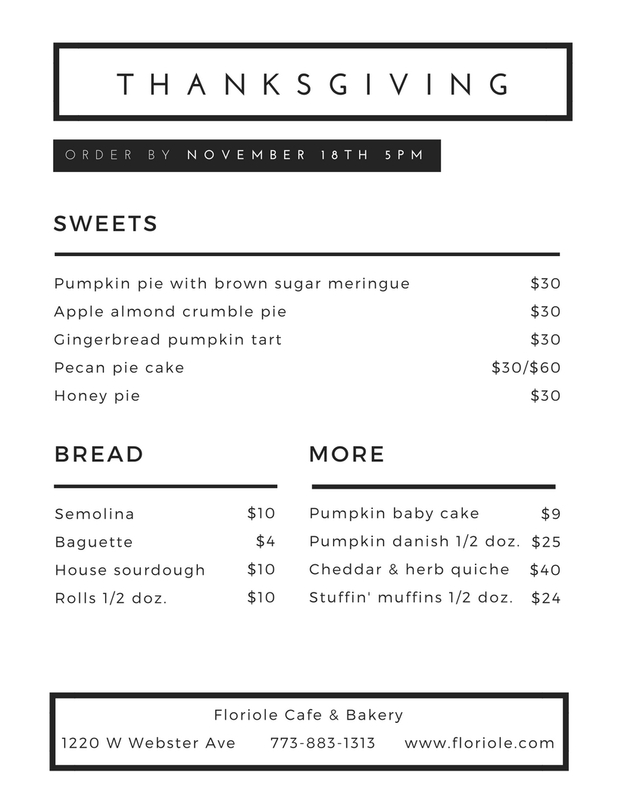 We are excited to release our Thanksgiving menu and hope you will order some sweets and bread from Floriole for your holiday spread. Without further ado, I present to you our 2016 Menu. You are welcome to place your order at the bakery, over the phone or in our online store. We will begin accepting orders November 1st and all orders must be placed by November 18th at 5pm. Please help us by ordering early! 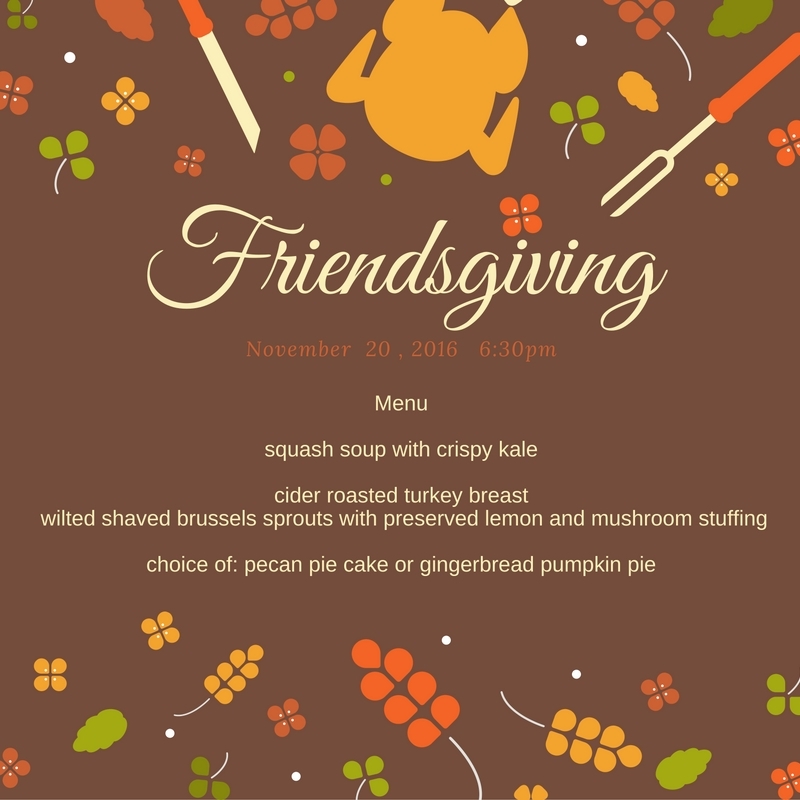 We are really excited to have a Friendsgiving Sunday Supper at Floriole this year. Gather up your favorite buddies and celebrate the Sunday before Turkey day. We will be cooking up a three course traditional turkey dinner $30/person. Tickets here. Stop by for a pomegranate milk chocolate scone, our November collaboration pastry. The recipe is from Malika Ameen’s baking book pictured below. 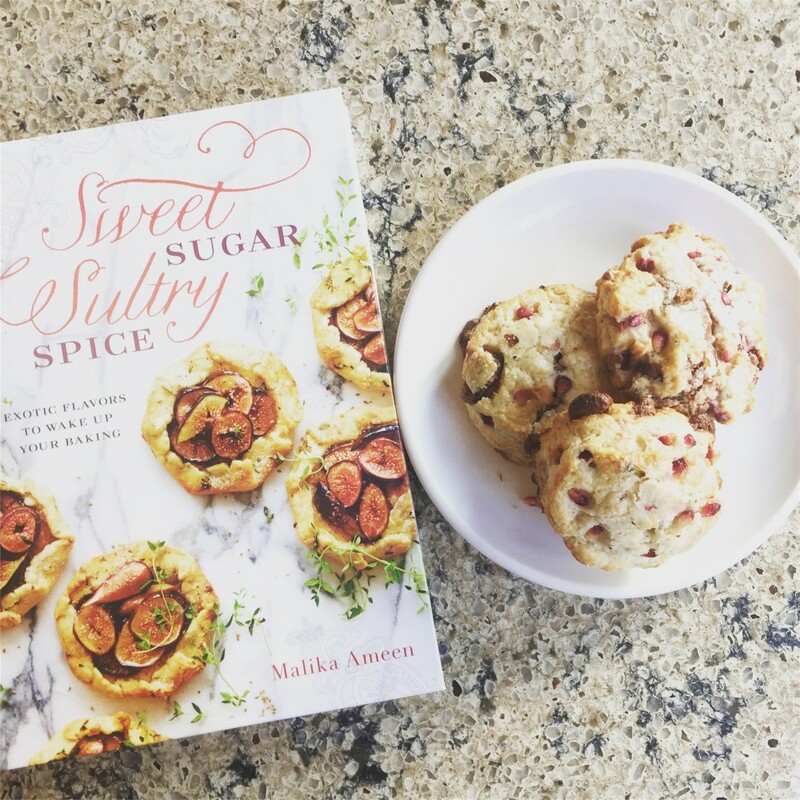 Join us for tea, sweets, special talk and book signing with chef / author Malika Ameen and her new baking book Sweet Sugar, Sultry Spice: Exotic Flavors to Wake up Your Baking with a collection of over 75 recipes to raise your desserts to a whole new level. The book discussion will be moderated by Sandra Holl and Floriole Bakery will provide a selection of treats from the book with specially selected teas from Rare Tea Cellar. Copies of the book will be available for purchase and signing. Tickets here or at the bakery. Sandra. Stella and I are just back from 2 weeks of vacation. One week in France and one in Italy. Great times, great food. There’s only one reason we were able to go on vacation: our awesome team. If you own a small business, you know how worried you can get when leaving your baby. But when you are lucky like us, you are able to do that and enjoy your time off. Of course, sh*t happens, and it did, it always does (even when we are around). So what matters is how it is handled. And it was handled wonderfully. So, this coin is about recognizing the various individuals who contribute to our success by caring about the bakery. James Beard Awards stay in Chicago! That’s right! Chicago will continue to host the “Oscars of the food world”: The James Beard Awards, until 2021! The awards honor the “best of the best” in the industry from food writers and chefs to restauranteurs and bakers. In 2016, three Chicago chefs and restaurants received awards: Alinea, was named most outstanding restaurant in the country, Curtis Duffy, of Grace, was named best chef Great Lakes and Land and Sea Dept. won outstanding design for Cherry Circle Room. 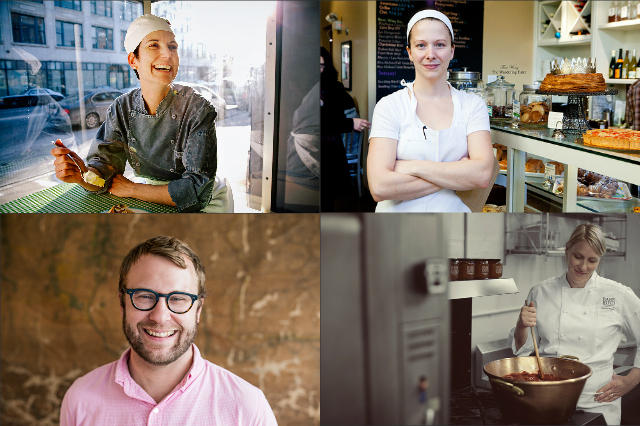 Please consider supporting your favorite Chicago chefs and restaurants by nominating them here before December 1st! Labor Day has come and gone and Le Coin de Mathieu is moving to the top of the newsletter. After 10 years of working two jobs, I’m finally down to one: I work for my wife. I won’t say whether I had better boss or not, that might get me in trouble. What I can share is that losing one job has lifted a heavy weight from my mind. Of course, there is always something to do at the bakery: to fix, to improve, to create, but being able to focus on this is a blessing a long time coming. I’ve written previously about the importance of gratitude and the awareness of what has been received. It was not my decision to go down to one job, but I already know I will look back happily on it. September Pastry Collaboration with Leigh Omilinsky of Nico Osteria! 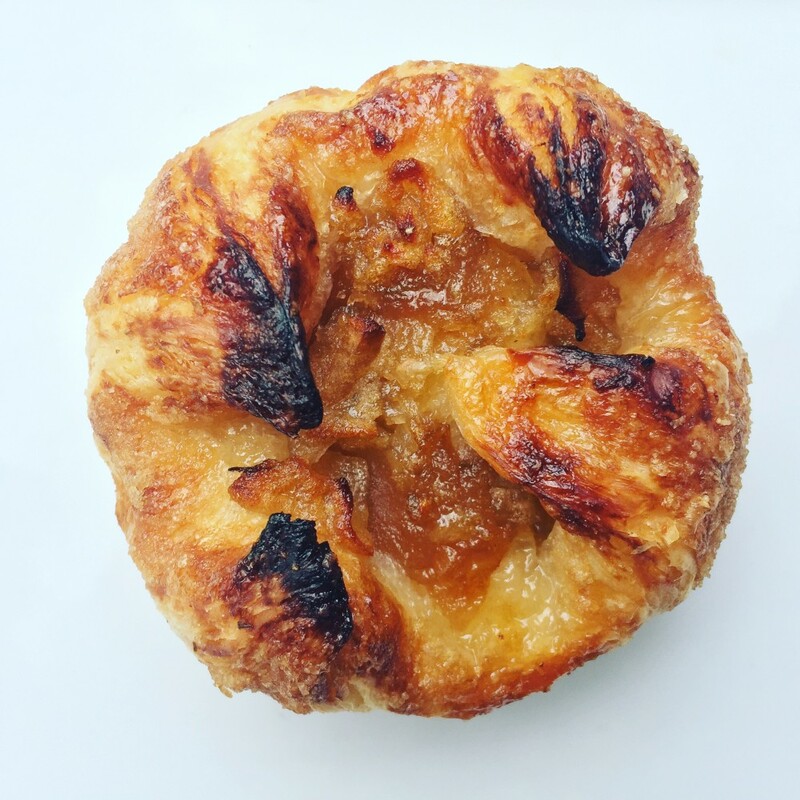 Leigh and I put our heads together to dream up a pastry that combines two of our favorite things: kouign amann and 20 hour apples. If you aren’t familiar with kouign amann, it is a flakey layered pastry somewhat similar to a croissant with the addition of salted butter and a hefty amount of caramelized sugar. 20 hour apples are an amazing way to take the humble apple and concentrate all its apply flavor. We added the apples to the center of the kouign amann and the result is great! Just try it, we think you will agree. 20 hour apple KA will be around at Nico and Floriole all month $4 each. Come and get it! Tuesday, October 18th Thanksgiving Orders Open! July was a hot and busy month but we made it through our first time at the Green City Market BBQ and the annual Sheffield Garden Walk. On top of that, we added a beehive to our rooftop garden. We feel like new parents and hope our babies make some tasty honey. August has arrived along with corn, peaches, plums and tomatoes. The abundance of local produce is reflected in the pastry case and on the menu, from BLTs and blackberry tarts, to corn salad and peach galettes. It’s a great time to come in and try something new. 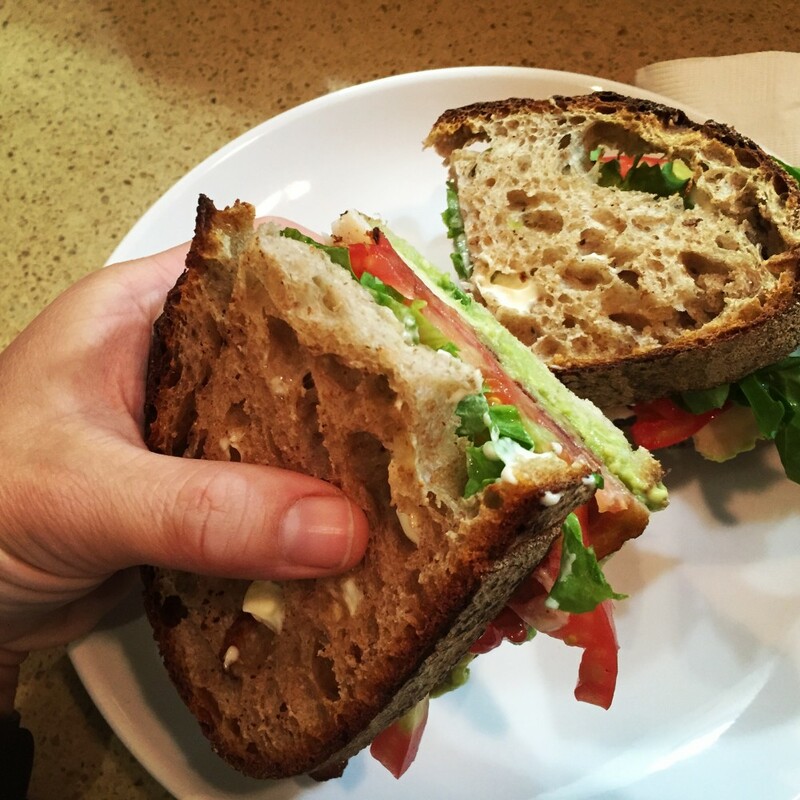 BLT with Green Acres heirloom tomatoes – upgraded to a club with the addition of sliced turkey and avocado. 100% yum! Join us for a dinner that celebrates corn! Three courses for $30 and there is a special $15 menu for kids 12 and under. For the month of August we are collaborating with Meg Galus, executive pastry chef at Boka, Swift & Sons and Momotaro. She is a French Pastry School graduate and was a finalist for the James Beard Award for Outstanding Pastry Chef. The collaboration bar is chocolate marshmallow topped with black raspberry pate de fruit on a buckwheat crunch base and the bar is enrobed in Illanka chocolate. The best part about this collaboration is that we will be donating $1 for each bar sold to the Valrhona Clean Water Project. Readers, if you follow this newsletter, you know that we tried to setup a hive on our roof top. Well, it did not go as planned… a month later, there was not a single bee alive. Where is the luck of the beginner ?? We were seriously disappointed and thought we were done for the year (and honestly not sure we would have tried again). Well, well, well! Our new general manager Jonie, introduced us to her friends Dave and Jenie. They are also first year bee-keepers but they know their stuff. They came to the bakery and offered to give us a few frames from their hive! They were able to split their hive, get worker bees to raise a new queen, get the queen mated and start laying. So here we are, with a hive in much better shape than the first time around with frames getting full of honey and brood back on the roof. Of course, we’re not out of the woods yet. Winter is coming (where did I hear that ??) and a lot of hives do not make it through. We will start feeding our bees a mix of water and sugar so they can build their reserves and hope for the best. Dave and Jenie will stop by from time to time to help us keep things going. 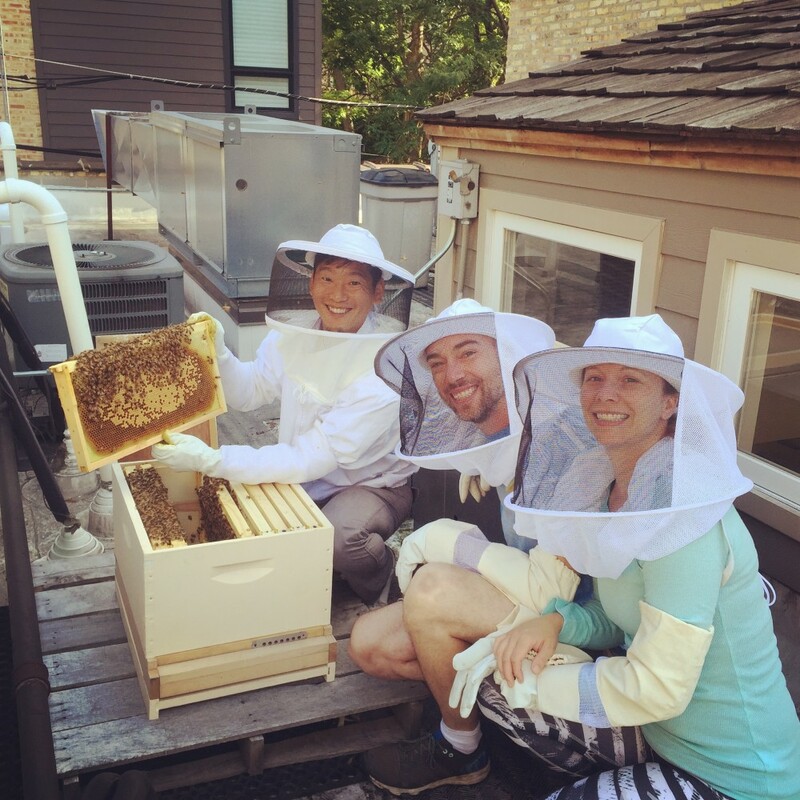 We already plan on exchanging city honey for their suburb honey and taste how they differ. Sandra and I are so grateful and happy. Blueberries, raspberries, and cherries Oh My! In late June or early July we progress from strawberries and rhubarb to ALL the fruit. It’s an exciting frenetic time of year to go into our walk-in cooler and see tray after tray of fruit. Blueberries are back in the scones and topping the lemon posset, raspberries sit piled on top of bavarian cream in fresh fruit tarts, red tart cherries are in clafoutis, and galettes are mixed berry. Soon enough we will begin seeing more stone fruits and we will find happy homes for them too. Eat up and enjoy the local produce of Illinois, Wisconsin and Michigan. Sunday, July 17th at 6:30pm. Three courses for $30, tax, tip and beverages not included. Floriole loves kids so we have a special children’s menu so the whole family can enjoy our suppers. Tickets are available here or in the cafe. This month we are collaborating with Kelly Helgeson, pastry chef at Lula Cafe. Kelly graduated from the baking and pastry program at Kendall College before honing her skills at restaurants like L2O, Los Angeles’ Bottega Louie and Oxheart. She has been at Lula since late 2013 and was honored with the Jean Banchet award for Rising Pastry Chef. 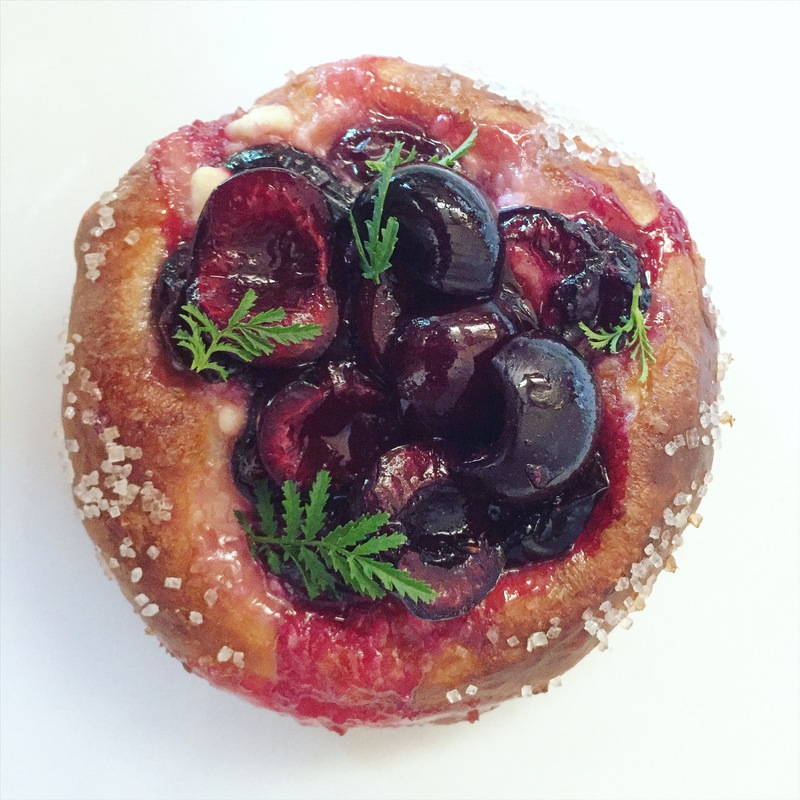 Kelly and I worked together to develop a cherry brioche. 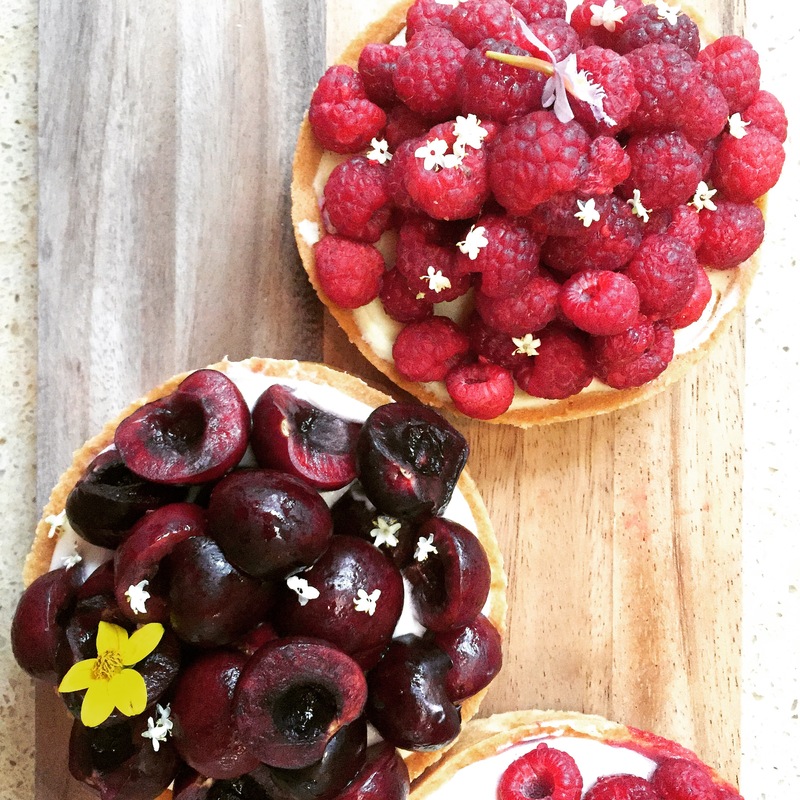 She had the brilliant idea of using marigold sugar with the cherries and setting them on top of a little d’affinois cheese. You can taste the creation at Lula Cafe and at Floriole throughout the month of July. The savory team has been busy with the recent influx of seasonally available produce. Our daily salads are all new this month to show off what is best at the farmers market. Sometimes menu items need a vacation too . . . They will be back so don’t get too upset! The grilled cheese and mac and cheese have left the premises for their lake house in Michigan and the BAD will join them once the heirloom tomatoes begin filing in the kitchen door. In late June we had the chance to visit Breslin Farms in Ottawa, IL. Molly and John Breslin, the father daughter team, aim to grow heirloom varieties of produce using sustainable practices that promote biodiversity. 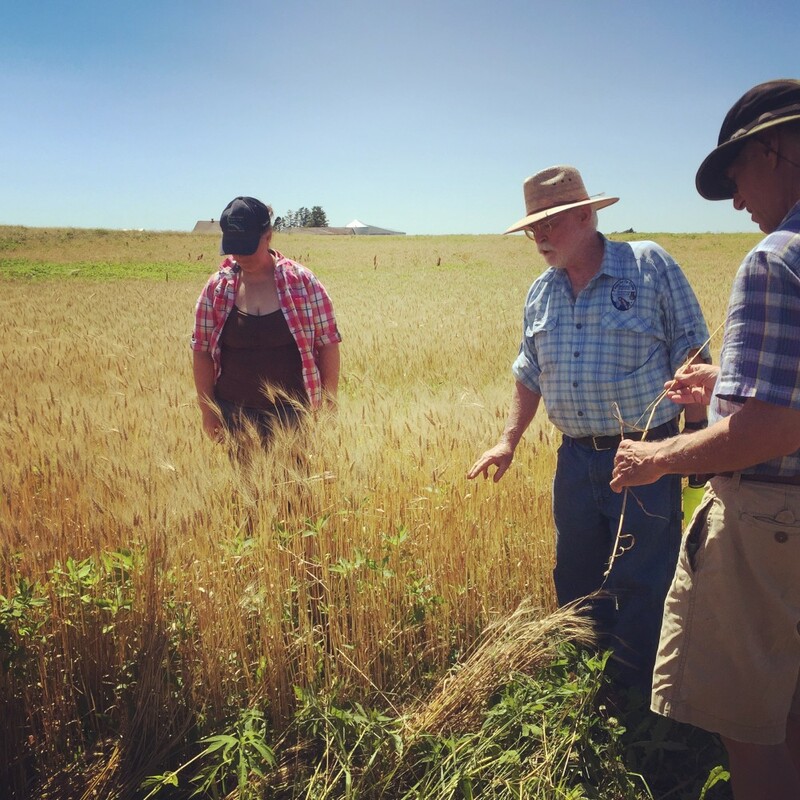 We took a walking tour of the fields where the Breslins grow rye, Arapahoe wheat, garlic, several varieties of corn, beans and other fruits and vegetables. We proudly use wheat and rye grown by Breslin Farms in our breads. Molly and John Breslin in a field of Arapahoe wheat. Strawberries have arrived and we are celebrating the only way we know how – by putting strawberries in as many pastries as possible. 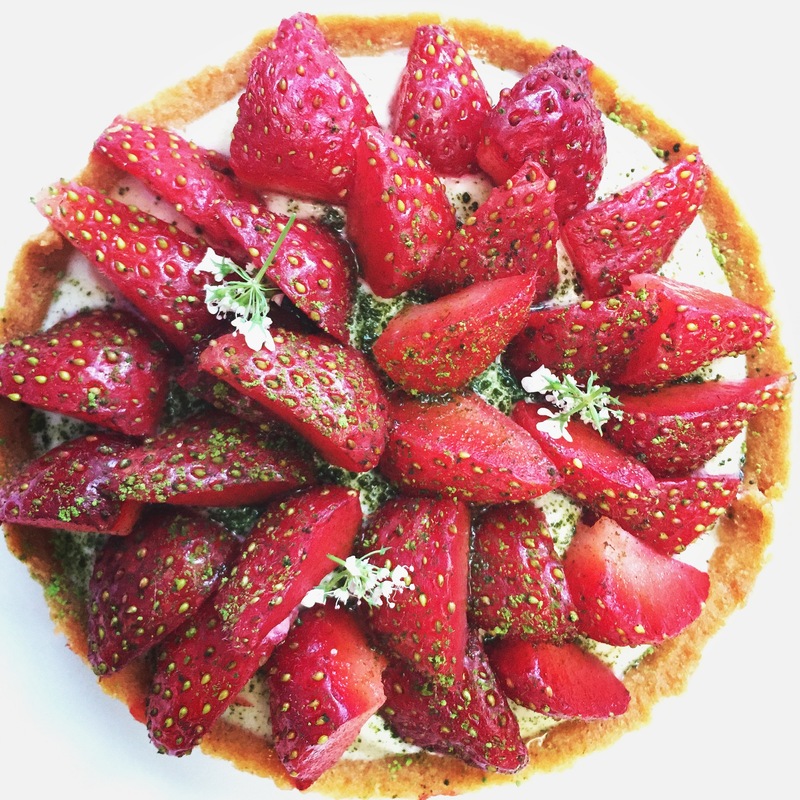 Come by the store and you will find: strawberry matcha tarts, strawberry rhubarb danish, fraisier, strawberry shortcake, strawberry cheesecake mousse, strawberry panna cotta . . . . I’ll stop before it sounds like Forrest Gump. You get the idea. If you like strawberries, and who doesn’t, we’ve got you covered. 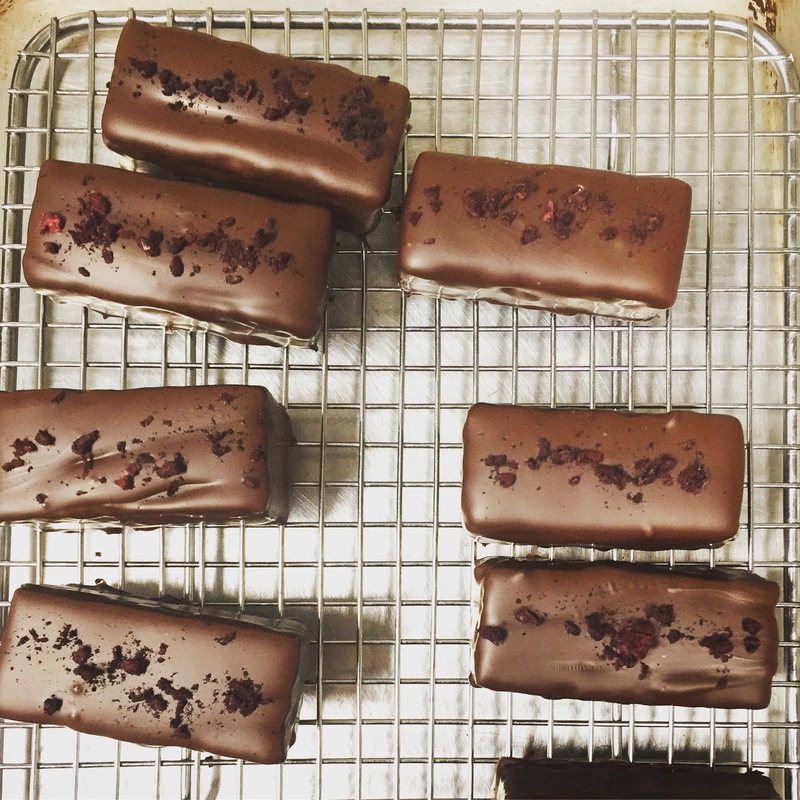 This month we are collaborating with Chicago’s renowned pastry chef, Mindy Segal. Her restaurant, Mindy’s Hot Chocolate, is a Chicago staple for great food and sweets. 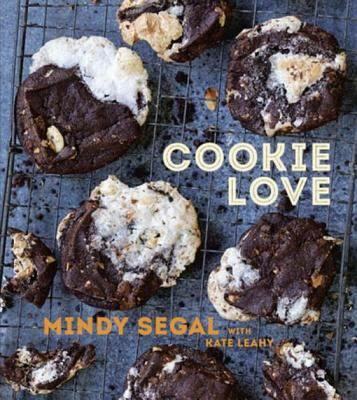 Cookie Love, Mindy’s first cookbook, is a gem packed with tips and interesting delicious recipes. For the collaboration, we are making her strawberry rhubarb rugelach with oatmeal streusel. Mindy describes the cookie as “a fruit crisp disguised as rugelach.” Cream cheese dough is slathered with house made strawberry rhubarb preserve, rolled up and then dusted with streusel for a nice crunch. We will have the rugelach at the bakery all month and hope you will come by to give them a try. 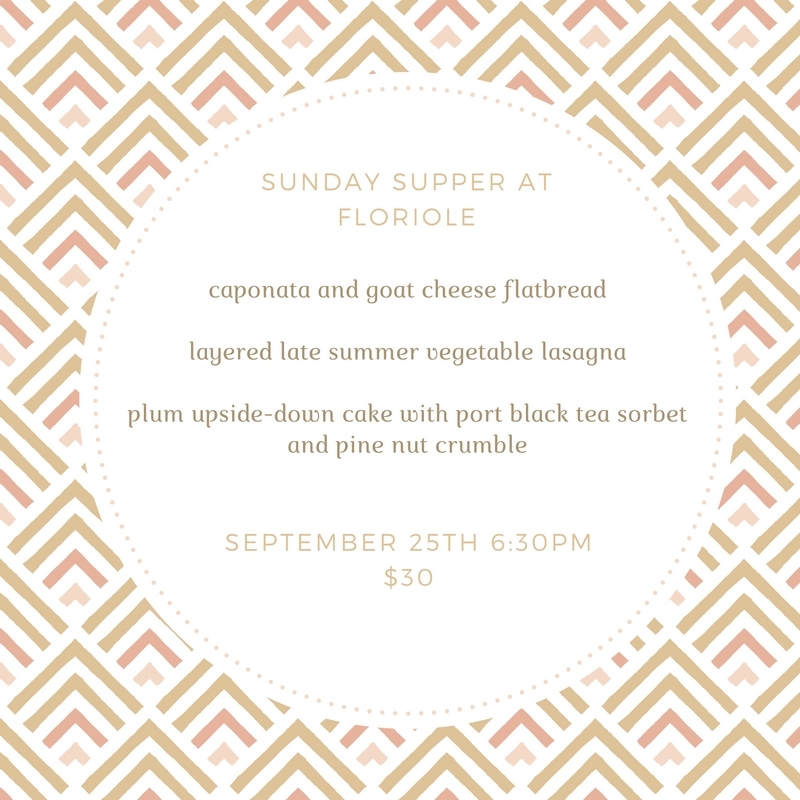 If you can’t make it to Floriole, here is a link to the recipe or pick up a copy of Mind’s book. I recently returned from an unforgettable whirlwind adventure in Peru with eleven other pastry chefs, bakers and chocolatiers. 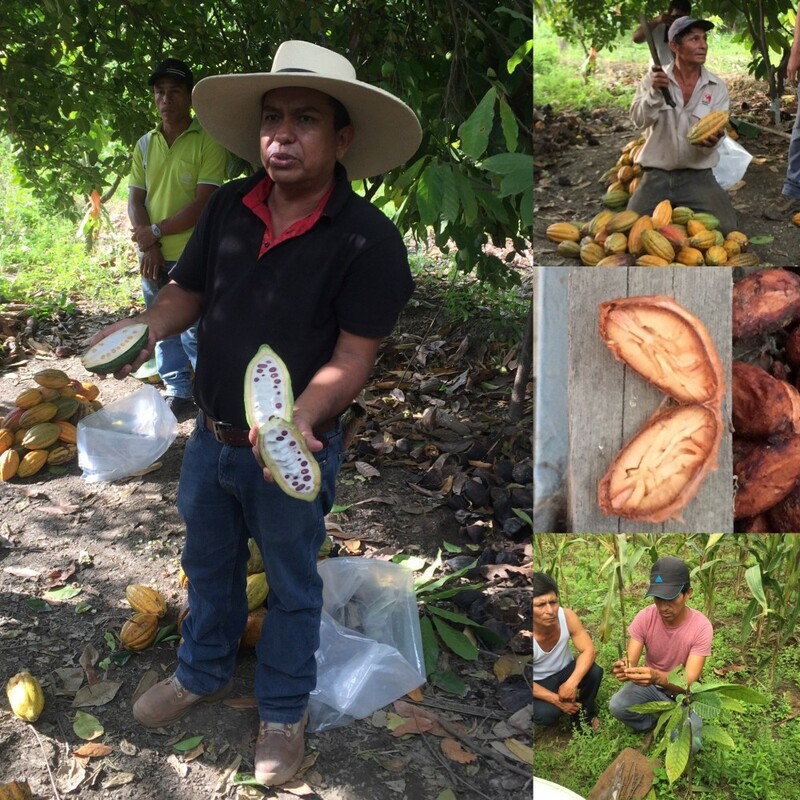 Valrhona invited all of us to go to the source of the cocoa beans growing in northern Peru. We had the opportunity to learn about the life of a cocoa bean from farming through processing before being shipped to the Valrhona factory in France. Since Floriole began at the farmers’ market, we have always taken pride in the fact that we know our farmers. We see them at the market on a weekly basis, have asked questions about the farming practices they use and feel confident that they are farming in a sustainable way. The fact is, that we never thought we would have the chance to meet the farmers who grow the cacao beans used to make the chocolate we use: we had to trust the company sourcing the beans. I am so thankful for the opportunity Valrhona gave me to meet those farmers. Somehow their chocolate tastes even better after this trip! I will post more pictures of the trip on our facebook page. 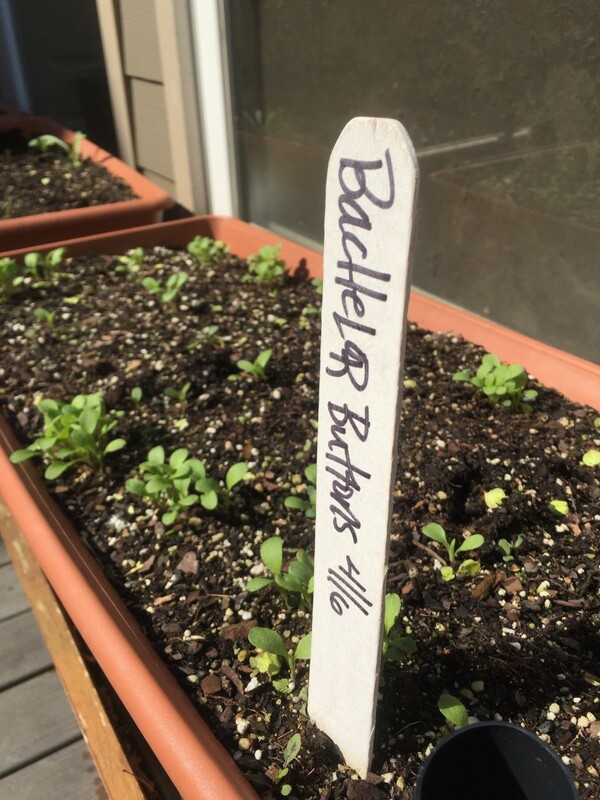 Floriole’s rooftop garden is coming back to life! May has arrived and it feels like spring has finally sprung. Outdoor farmers’ markets are getting started and we have local rhubarb and asparagus. Our rooftop garden is sprouting and our new bee hive is installed. We picked up our bees from Westside Bee Boyz when it was 80 F and got them into their hive before the temperature plummeted to the 40s F. Thankfully it is warming back up and we have finally been able to check on them. Everything looks good, they have accepted their queen and have already begun building. As the temperature warms, they will begin exploring the neighborhood to search for flowers. It’s exciting to think we will have honey soon! Feel free to look out the back window of the second floor to catch a glimpse of the bee hive on the west side of the roof. May 2nd – James Beard Awards – Congratulations to all the nominees and winners! What better way to celebrate the opening of the summer Green City Market than joining us at Floriole Cafe and Bakery for the summer’s first Meet the Market! Meet the Market is a chance for everyone to learn more about the market, support its mission, find out how you can get involved and last but not least, enjoy some delicious eats and cocktails. We will be making sweet and savory small bites accompanied by Band of Bohemia Beer and a specialty cocktail from our friends at New Holland. 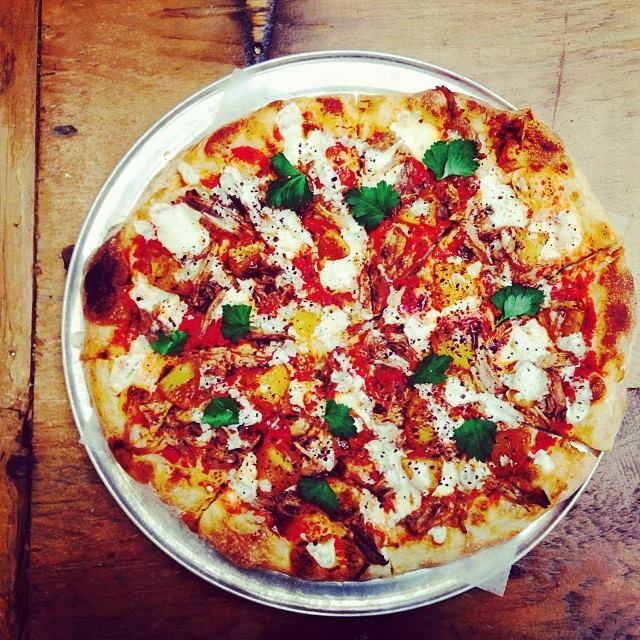 Rachel Post will be back in the Floriole kitchen with her amazing pizza. The dinner will be a $30 three course prix-fixe with salad, choice of pizza and a Floriole dessert. Get tickets here. Call them flødeboller or mallomars. Last month we collaborated with Cellar Door Provisions on langue de chat cookies. The process proved to be fun and educational. 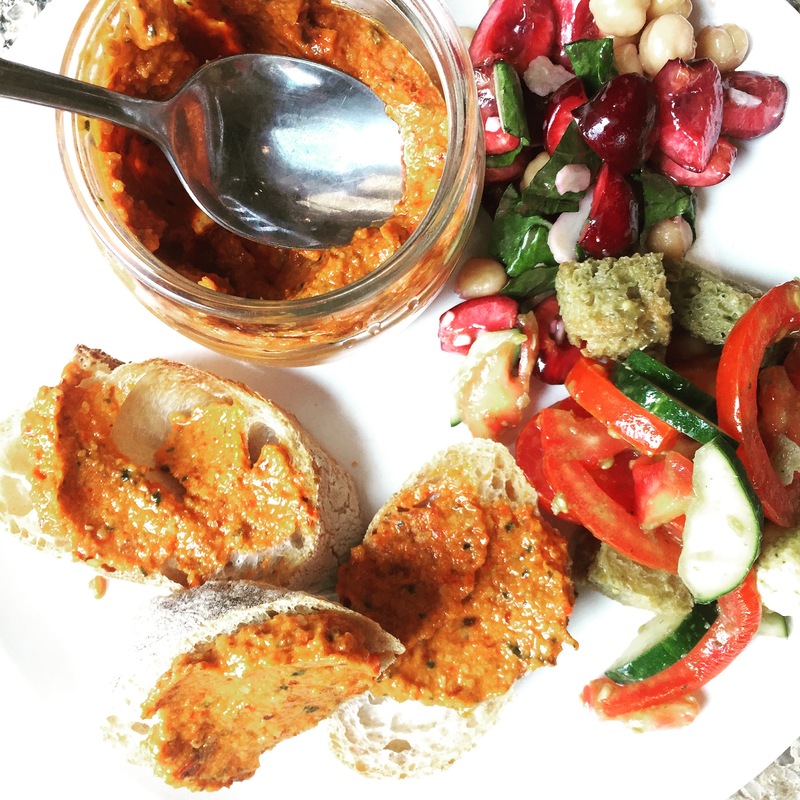 We loved working with the CDP team and hope you will visit their shop and enjoy the beautiful food they are creating. 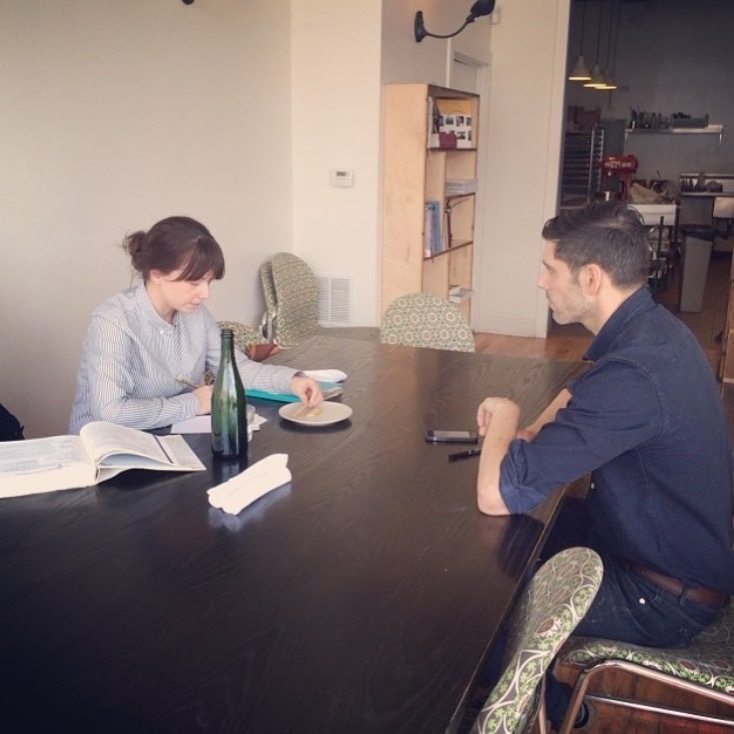 This month we are working with Anna Posey, the former pastry chef at The Publican and Publican Quality Meats. She and her husband, David Posey, will open Elske in late summer/fall. 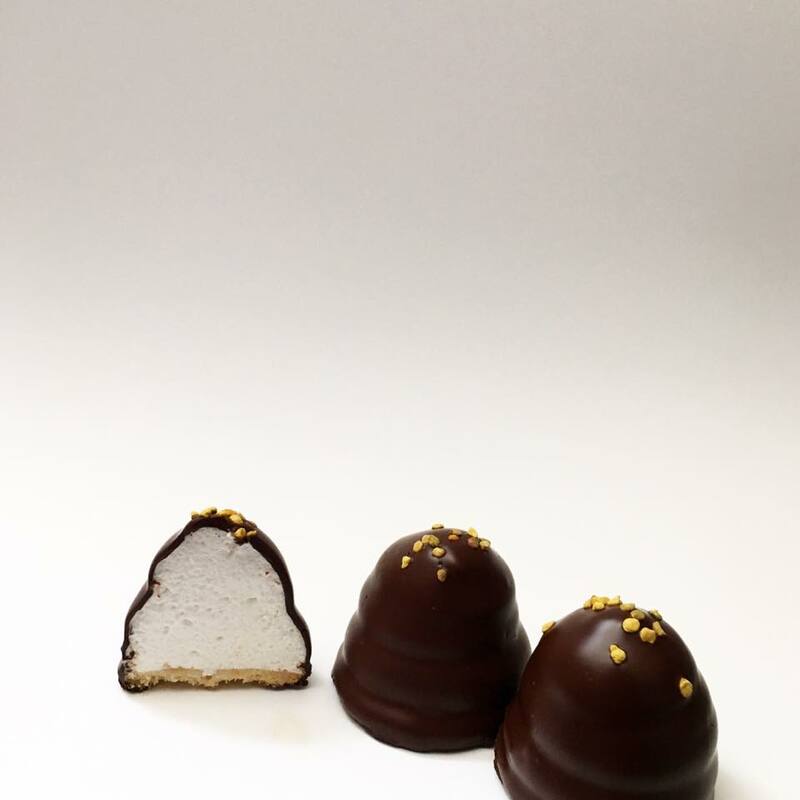 Anna chose to make a flødeboller with an almond shortbread base, honey fluff and dark chocolate coating. Wow! This is more than a cookie – it is a full dessert dressed up like a bonbon. Pastry chef Emily Spurlin is leaving Floriole to head up the pastry department at soon to open Bad Hunter. She has been an important force at Floriole that will be greatly missed.We hate to see her go but can’t wait to see the great things she does and how she will contribute to making Chicago an even better pastry town. Be sure to keep an eye on her because she is incredibly talented and creative. Best of luck Emily and thanks for sharing your talent with Floriole! This June 2-6, White Oak is hosting their next Chef in Residence Series dinner events featuring Chef Lucian Prellwitz and Chef Morgan Deeks. Hosting a collaborative cooking experience with Chef Tom Van Lente of White Oak, Prellwitz and Deeks will offer a special menu featuring French technique and Italian sensibilities while keeping in mind the American palate for guests to experience. 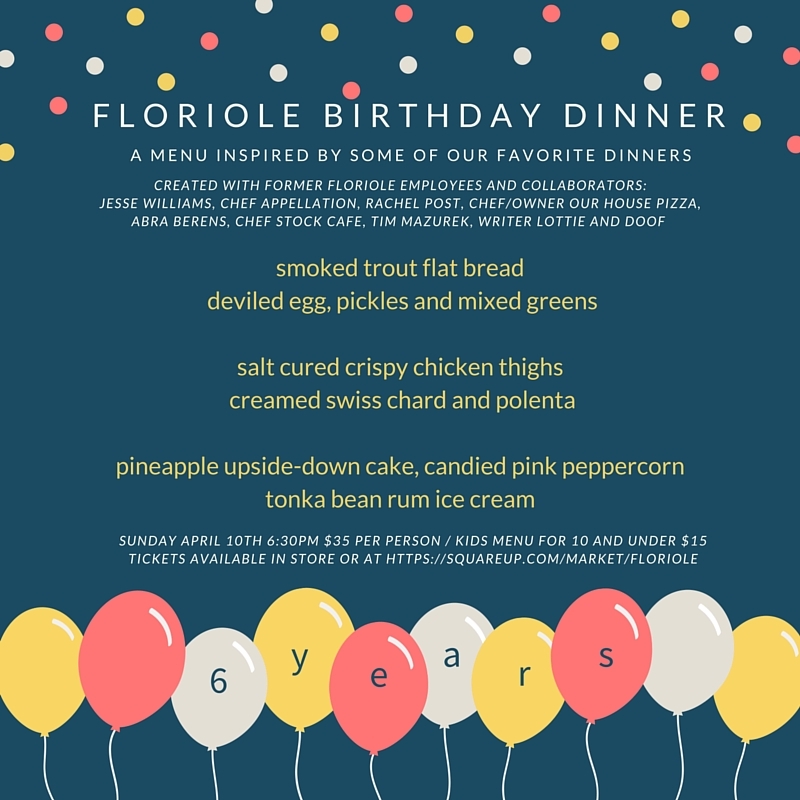 Join us for a Sunday supper at Floriole to help us celebrate our 6th birthday! 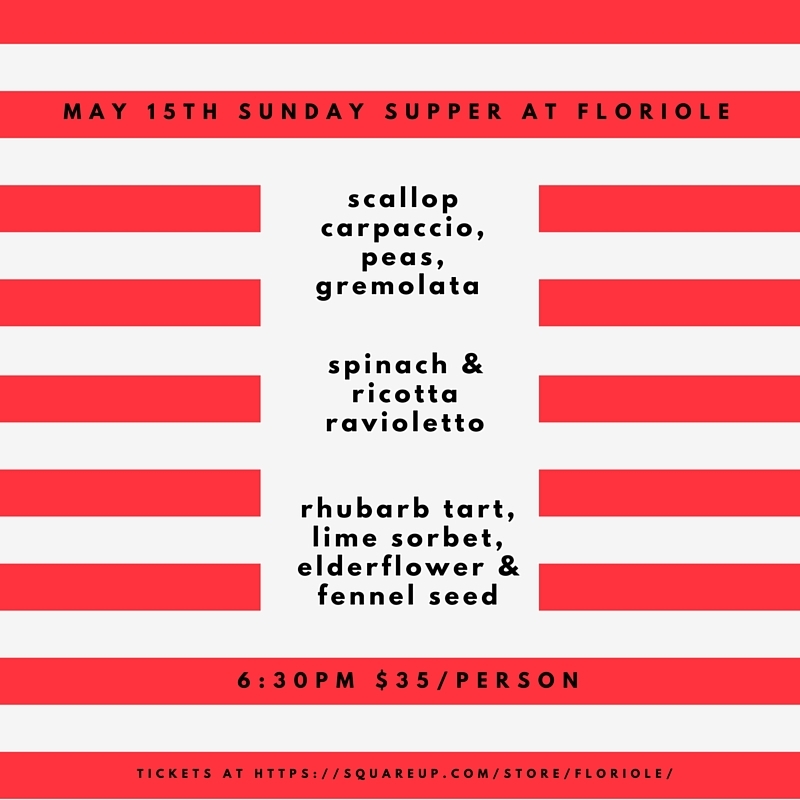 The dinner is a replay of Floriole favorites made by past employees and collaborators who are coming back to help us celebrate. The days have been long but the years have flown by and we are celebrating our 6th year at 1220 W Webster Avenue. We owe a big thank you to our loyal customers who have supported us throughout the years, starting at the farmers’ market 10 years ago through today at the cafe. Another huge thank you goes out to all the amazing team members who are, or have been part of the Floriole family. It takes a big team of driven, creative and quirky people to keep this place running. We couldn’t do it without you! We have big plans this year to call more attention to the rich Chicago pastry and baking scene through celebration and collaboration. 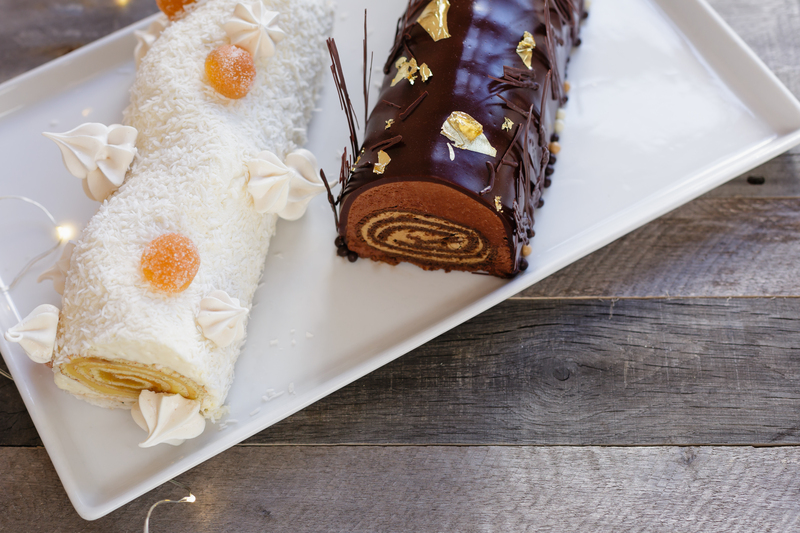 Every month we will work with a different Chicago baker or pastry chef that we admire to create one of their signature pastries or collaborate to make something new. Whatever we make will be available for the month. It will be a fun and inspiring year filled with new connections and shared learning. Please feel free to send us suggestions for collaborations! Hashing out the details at for our upcoming collaboration at Cellar Door Provisions. The year of collaborations is kicking off with my favorite place for pastry, Cellar Door Provisions. I have long admired their commitment to small batch perfectionist baking and cooking. They have a tiny case with an ever rotating array of interesting and lovingly made pastries. This is a place where my hyper charged mind actually decelerates allowing me to appreciate the intricacies of the beautiful food they craft. The staff is ever hospitable and warm making the experience all the better. For this first collaboration, we decided to make a typical French cookie called langue de chat. The literal translation is “cat’s tongue cookie”, a simple oblong butter cookie. Our version will be a sandwich cookie filled with raspberry jam and topped with sesame seeds and grey salt. You will be able to find these cookies at both Floriole and Cellar Door Provisions starting the week of April 4th. Last month, after a long hiatus, we revived our monthly suppers and it was a huge success. While the planning for that dinner was happening, it occurred to me that it would be fun to turn the April supper into a birthday celebration. The menu itself is a celebration of dinners past and the individuals that put those menus together. Buy tickets to the dinner here. We are sadly saying au revoir to the winter salad. It was a favorite but blood oranges are waning and spring ingredients are ready to shine. The spring update is pretty fantastic with beet cured salmon, pickled ramps and bagel crisps – sort of like a lox platter that has been transformed into a salad. 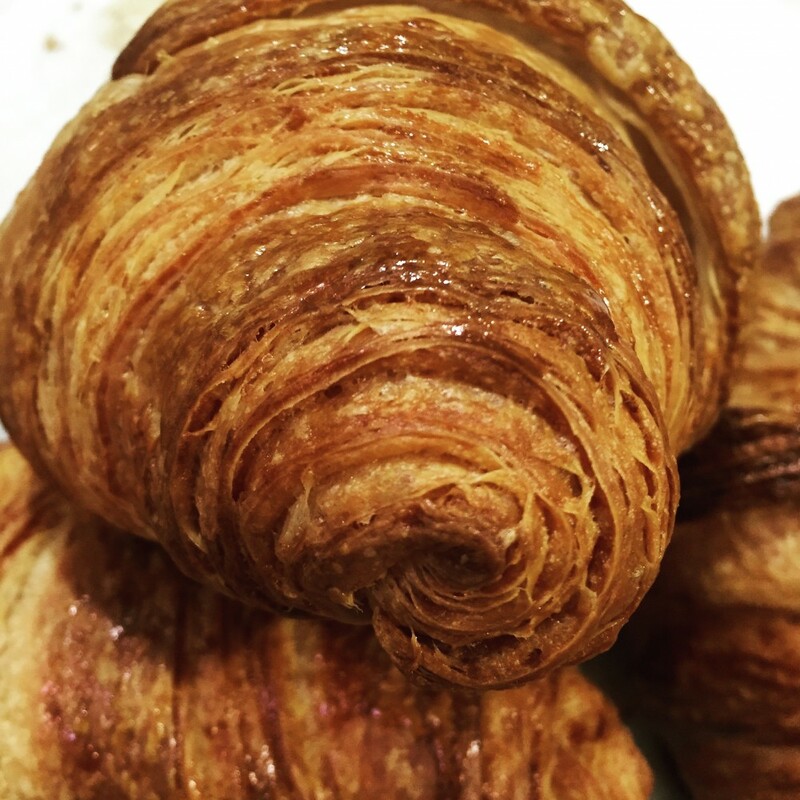 On the pastry side, look out for a some new croissants. We have a chocolate rye croissant that will become part of the rotation and we are really excited offer a vegan croissant made with our house made vegan butter. Check the website for more information about when to find these special croissants. Our neighbors at White Oak have started a chef in residence series and the first dinner is April 3rd with Josephine chef Andrew Little. More information here. Happy birthday Floriole dinner is April 10th. Tickets here. 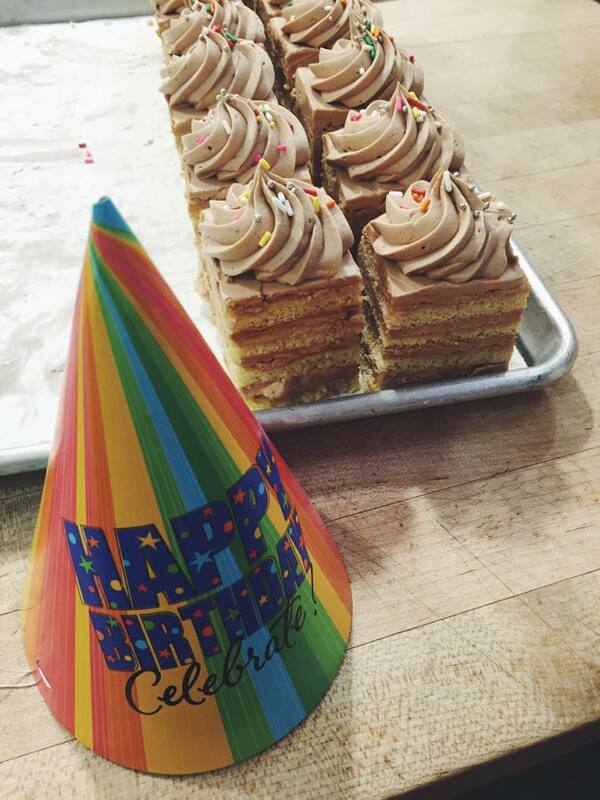 Stop in on April 16th for birthday cake to celebrate our 6th year at 1220 W Webster. Passover April 22nd – 30th. Please be sure to give 48 hours notice for special orders. We will have chocolate ganache cake and coconut macaroons throughout the holiday. Some call it nirvana. Some call it bacon heaven. BaconFest Chicago is a bacon lover’s wonderland. We will be there with our best bacony dish. Along with luxury brands, artisan bacon-makers, and “Bacontrepreneurs” who will all display, sample, and sell a multitude of bacon products. The best mixologists and brewers hand out bacon-inspired cocktails, beer and wine. This event sells out every year, so be sure to get your tickets here. 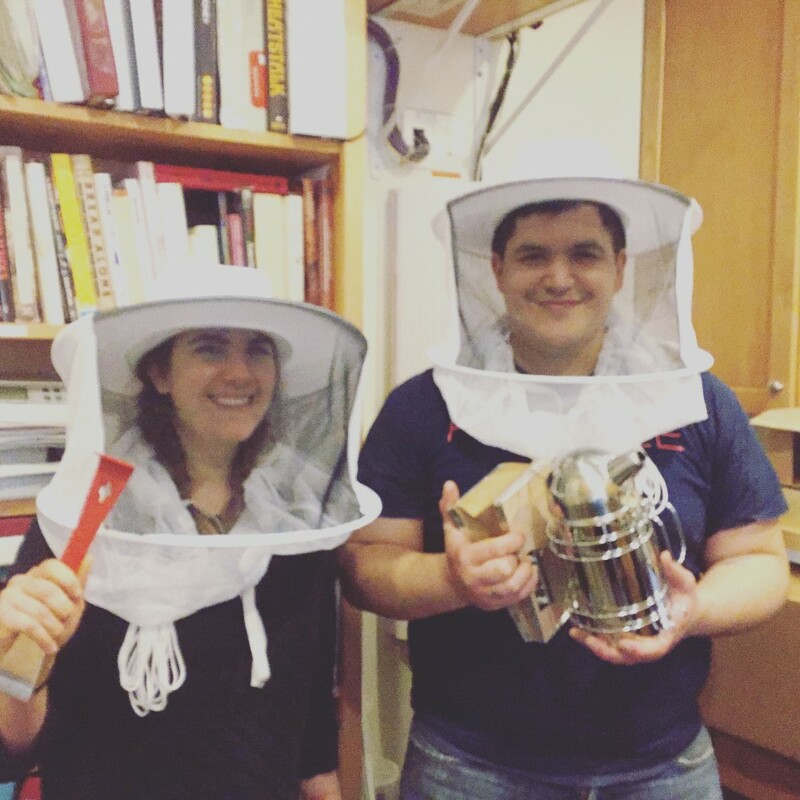 Pastry chef, Emily and Head baker, Alex are ready for the bees. Holy mackerel! Later this month, a “package of bees and a queen” will arrive at the bakery! Emily, our Pastry Chef and myself have been putting together the hive. I was thinking of putting it on the patio in the front but apparently that’s not a good idea so we’ll keep them on the roof in the back. Stella chose the hive’s peach color. We still need to finish putting together the honey comb foundation frames together and we’ll be “ready”. My late grandfather used to keep bees in his garden in Alsace and the smell of beeswax brought back those childhood memories. As most kids, I think, I was scared of being stung by the bees and I regret not spending more time to learn how to take care of them. Sandra demonstrated how to make savory bread pudding at the Good Food Festival this past weekend. It’s a simple and easy recipe, perfect for brunch or a light dinner. Use any leftover bread you have on hand, but we think our sourdough or semolina make the bread pudding extra special. 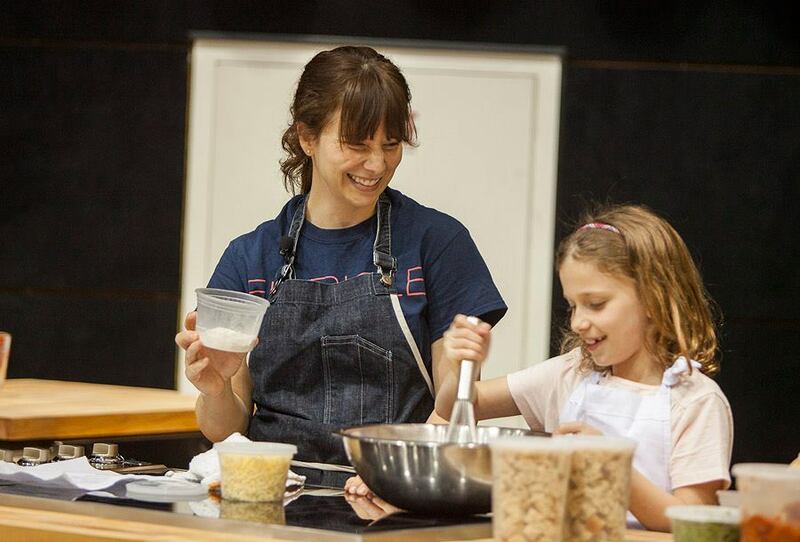 Sandra and a little helper demonstrating how to make savory bread pudding. In a bowl whisk together eggs, cream, milk, flour, salt, mustard, cayenne and pepper. Add the cubed bread and let sit for at least 10 minutes. Spread 1/3 of soaked bread cubes over the bottom of the buttered pan. Top with 1/2 of the greens, roasted tomatoes and cheese. Add the second third of the soaked bread cubes and top with the remaining vegetables and cheese. Spread the remaining bread cubes on top of the vegetables and cheese. If there is any remaining egg and milk custard in the bowl, pour it over the bread. At this point the dish can be covered and refrigerated for up to 24 hours. Bake at 350 F for 40-60 minutes or until the top is crispy and the custard is set. 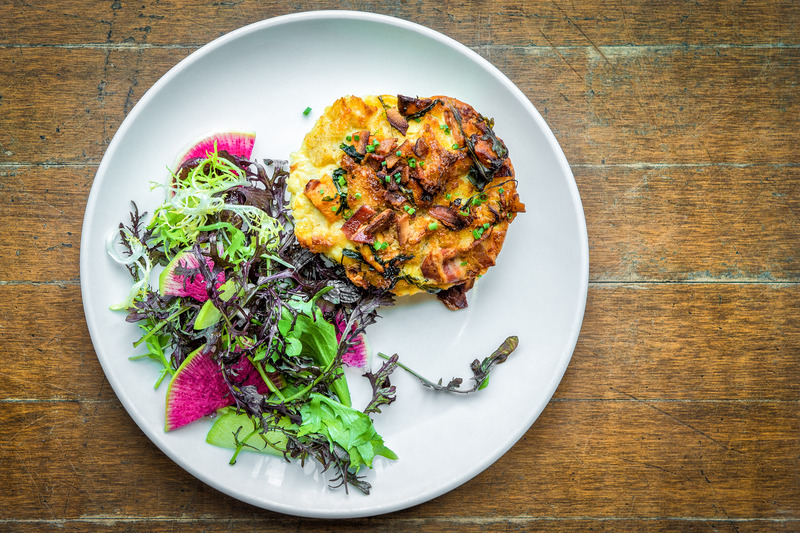 Savory bread pudding with side salad at Floriole.